I know what you’re thinking. Eggs? Really? Eggs are nothing new. But the new change to the U.S. dietary guidelines coming out for 2015 has shed a new light on eggs. According to a number of studies over many years, science has shown that dietary cholesterol can only change the levels of serum cholesterol, or the levels of cholesterol found in your body, by about 4%. The federal government has finally decided to acknowledge this science-based evidence and lift the cholesterol restrictions in the previous dietary guidelines. This means that eggs can finally be acknowledged as the super food that they really are! Eggs have always gotten a bad rap because of the yolks high-cholesterol content. But now that dietary cholesterol has been rendered inadequate in significantly changing serum cholesterol, eggs are free of this deleterious health effect. Meaning all of its amazing health benefits that have been ignored due to this one bad element can finally shine through! Eggs are one of the few foods in the world that are considered a “perfect protein.” This simply means that they contain all of the essential and non-essential amino acids, which are the building blocks of protein in the body. Not only are eggs a perfect protein, but they contain large amounts of other essential nutrients that the body cannot synthesize on its own. Eggs contain Vitamin A, Folate, a number of essential B vitamins, phosphorous, selenium, Vitamin D, calcium, and zinc. With all of these nutrients packed in eggs, it would seem eggs would have to be very caloric, but they are in fact relatively low calorie with only about 80 calories per large egg. If you’re not convinced by the nutritional value, maybe the versatility of eggs can sway you. Eggs can be eaten in so many ways it’s hard to even keep track. You can hard boil them, devil them, fry them over easy, fry them over medium, fry them over hard, fry them sunny side up, scramble them, poach them….I could go on but I wouldn’t want to bore you. And those are just the ways of cooking them. We haven’t even gotten into what you can make with them! 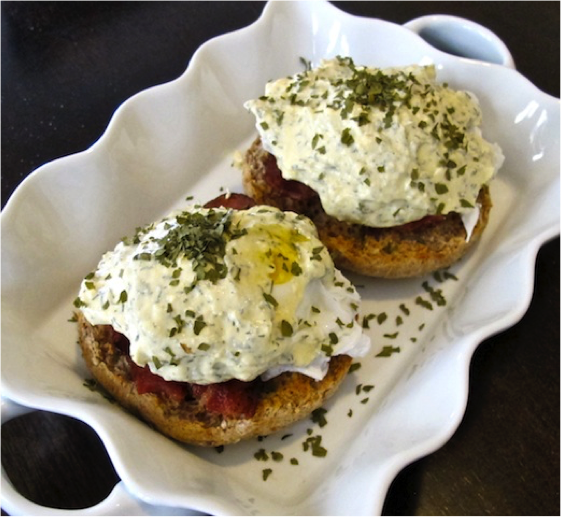 Below is a healthy recipe to get your creative juices flowing, but I challenge you to come up with your own new ways to incorporate eggs into your diet! They are, after all, the “perfect” food. Fill a large sauce pan and a small saucepan with 2/3 water. Bring the large to a boil, the small to a simmer. Mix together the Greek yogurt, egg yolk, and lemon in a small heat-safe bowl. Once the small sauce pan is simmering, place your mixture in the water. Heat and stir occasionally until the sauce thickens – about 10 minutes. Toss your turkey bacon in a pan sprayed with olive oil and cook for about 2-3 minutes per side. Drop your English muffin in the toaster. Now that the large pan of water is boiling, stir in 2 tsp. white vinegar. Carefully crack each egg into the water. Use a spoon to push the white portion of the egg toward the yolk if it appears to be coming apart. Turn the heat off and cover the pan, cook for 4 minutes. 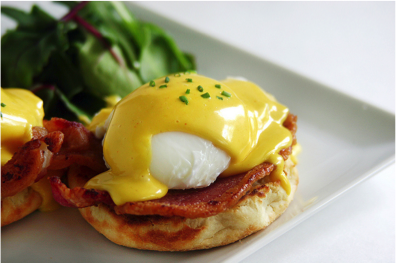 While the eggs are cooking, assemble your benedict. Top each muffin half with a strip of bacon, then add the egg. Your hollandaise should be done now too. Carefully remove the bowl from the saucepan and add the remaining ingredients. Top the benedicts with the sauce.